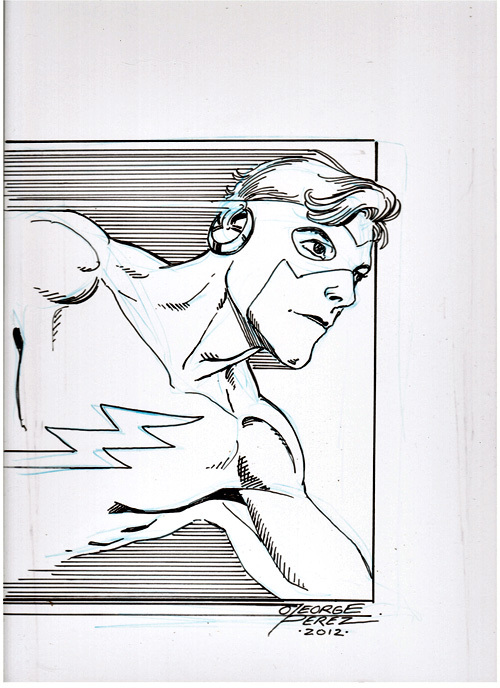 KID FLASH (Jul 2001), art by George Perez at SAN DIEGO COMIC-CON 2001, from Darlene A. GREEN LANTERN and FLASH (Hand Colored) (2004), art by George Perez, colored by Tom Smith in 2005. FLASH, WONDER WOMAN and BATMAN (2003), art by Mike Wieringo, George Perez, and Mike Deodato. Commissioned by Paul Singh. FLASH, WONDER WOMAN, SUPERMAN, GREEN LANTERN and BATMAN (2003-2005), art by Mike Wieringo, George Perez, Doug Mahnke, Mike Deodato, and Drew Geraci (inked by Drew Geraci). Commissioned by Paul Singh.